I took a trip yesterday afternoon to the Bo’ness and Kinneil Railway, a short heritage line run by the Scottish Railway Preservation Society, of which I am a member. It’s pretty close to where I live, within easy reach of Edinburgh and Glasgow, and although it’s one of the shorter heritage railways, a day out there has a lot to offer. Bo’ness station has a nice cafe, a big model railway, and a visitor trail that takes you past some of the working bits of the site to the Museum Of Scottish Railways. This is the UK’s biggest rail museum after the National Railway Museum in York, and it’s got a great selection of exhibits in it. 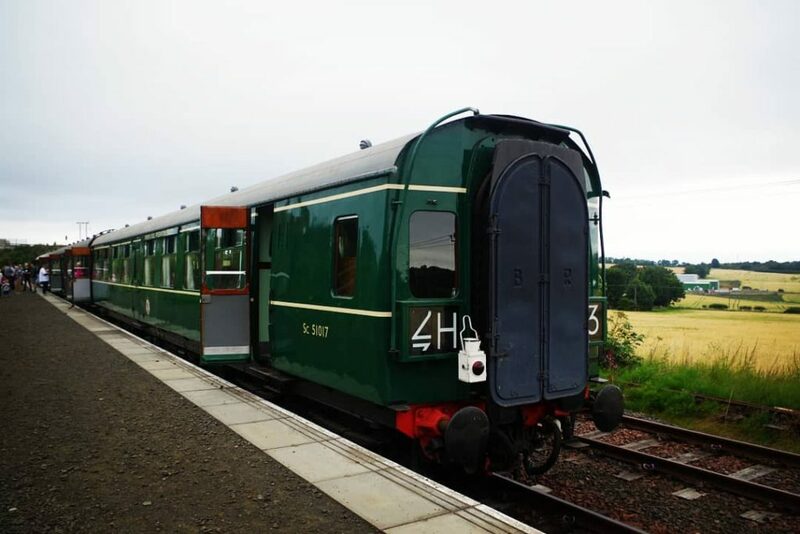 Anyway, the reason for my visit yesterday was an opportunity to travel on a unique train amongst the collection at Bo’ness – the final survivor of a batch of 1950s diesel trains built for the Glasgow to Stranraer and Largs lines. They’re of a type classed as “Swindon InterCity” trains, and there were quite a few of them once, but all had been withdrawn from regular service by the early 80s. Most were scrapped, but this one has been painstakingly restored from scrapyard condition to its original 1950s splendour. I’d seen it at Bo’ness lots of times, but it doesn’t come out to play very often, and I was itching for a ride. Here’s a few pictures I took. The other driving vehicle has a different cab design. When formed in the middle of a train, people could walk through to the next coach. Luxurious interior. 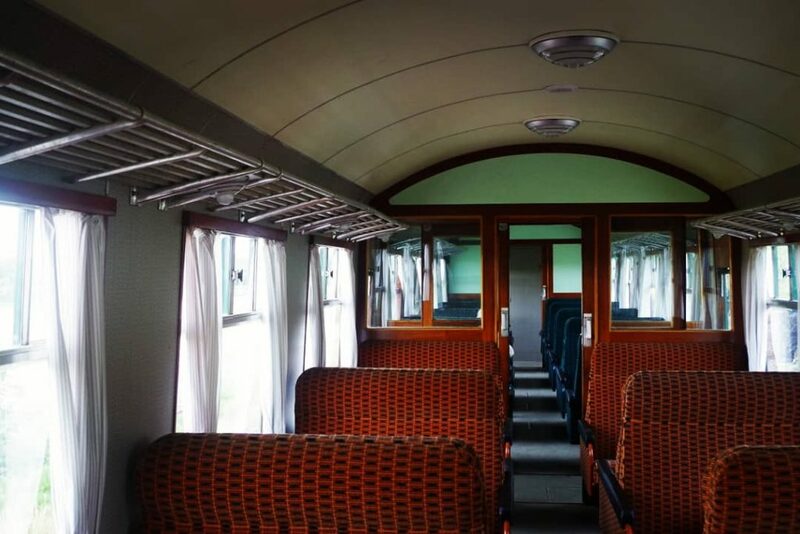 Compared to the steam trains these replaced, the coaches were clean, bright and modern – check out the Formica panelling and groovy seat fabrics! 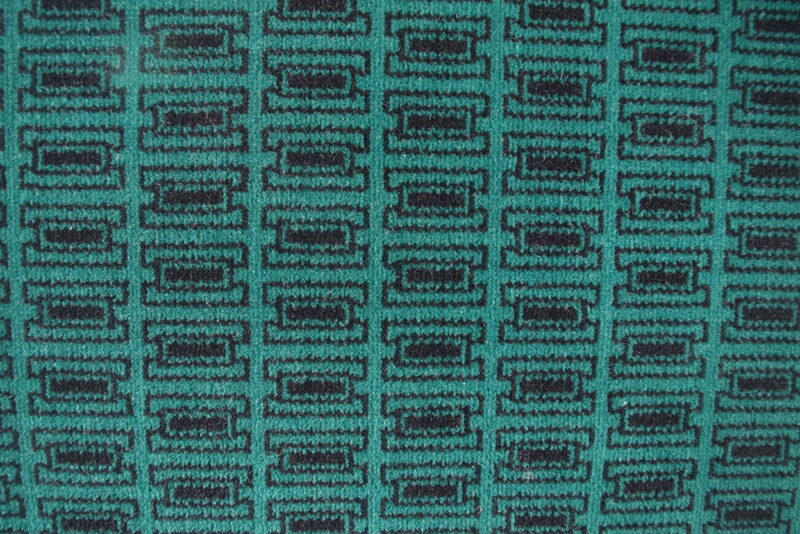 Close up of seat fabric. Compared to modern trains, these are slow and noisy, and they vibrate like hell with rattly engines under the floor, but I love the way they clunk and lurch along, and the design is a classic of its time – the colours and textures and surfaces are all gorgeous, and the whole thing has a homely and cosy atmosphere inside, especially with the warm glow of the tungsten lighting. And that green paint job! It happens to be my favourite colour. I greatly enjoyed my sedate and rattly cruise through the landscape. The group that’s restored this train deserve a huge amount of credit for doing an almost impossible job. Most trains built back in the fifties were liberally sprayed with asbestos insulation to reduce noise and keep heat in, which it does very well, but sadly people didn’t really understand what lethal stuff it was back then. 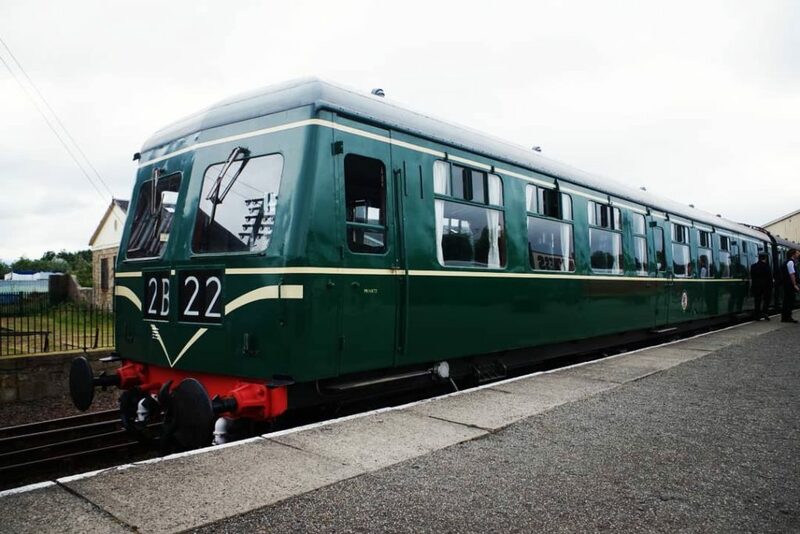 Anyone attempting to preserve vintage rolling stock then has to get all the asbestos stripped out, which in this case was hugely expensive and also completely destroyed many of the original fittings, so they had to be recreated from scratch. Sadly, many historic vehicles have been lost because this is far too difficult a task for the small groups attempting to rescue trains like these. The owners were lucky enough to get lottery funding for the restoration, but it still took them many years to get the train back to its pristine state. The train doesn’t run very often, but it’s next out and about for a few days in September. As a lover of things vintage and also a little out of the ordinary, I loved this – do go and check it out!